Editors: Waller, Tim, Arlemalm-Hagser, Eva and Beate Hansen Sandseter, Ellen et.al. There has been a growing academic interest in the role of outdoor spaces for play in a child's development. 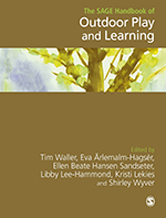 The SAGE Handbook of Outdoor Play and Learning represents a coordinated and comprehensive volume of international research on this subject edited by members of the well-established European Early Childhood Education Research Association Outdoor Play and Learning SIG (OPAL).